My love for Snapchat continues. 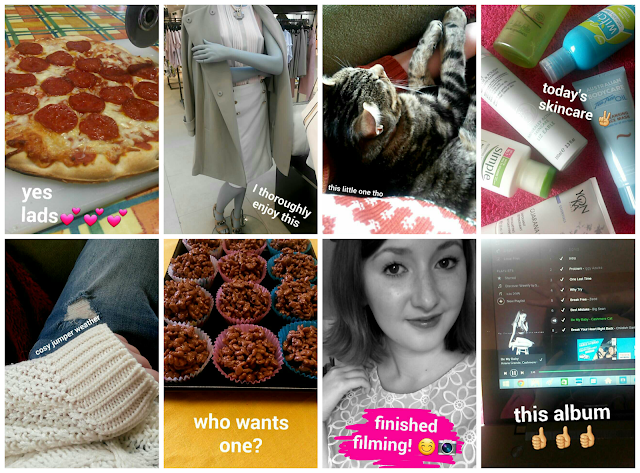 Here's another roundup of just a few of the snaps that have featured in my stories over the past wee while! Food makes a regular appearance on my stories and who can complain when it's pizza? Naturally, Mia gets plenty of camera time too! I also love sharing beauty bits & bobs and sometimes what I'm wearing. This outfit in M&S was too pretty not to share - look at that gorgeous coat! Of course, if you want to see the videos I share on there, you'll have to add me! Well I hope you enjoyed this little roundup! I also love watching other people's stories so I was thinking of writing a 'Snapchatters I Love' post? Get involved in the comments below and let me know who your favourite people to follow on Snapchat are!